Congratulations! You and your tiny tender leaves are on the path of fruition. To create masterworks of art, artists must know not only how to begin, but also when to stop. 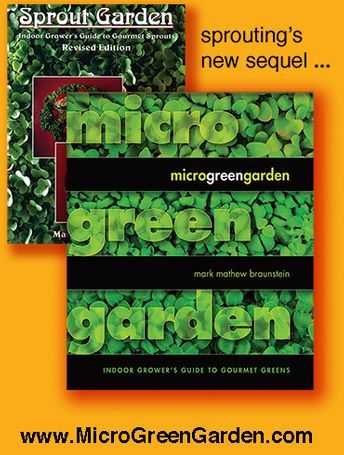 Likewise for master gardeners and their microgreen gardens. Sample your crops every day along their stages upon life’s way. And take notes. And note your notes. You likely will find peak succulence is reached before the second set of leaves emerges. Cress grows as a cluster of leaves, beans as shoots, and grains as blades, but for most garden vegetables the second set of leaves is a pair, as is the first set. The first pair is called the cotyledons or seed leaves, the second pair the true leaves. All seeds hold a reserve of nutrients intended for the infant sprout and seedling. This lunchbox is called the cotyledon, hence the first seed leaves are also called the cotyledon leaves. Most cotyledon leaves look identical regardless of species, and especially among the many species of the vast family of Brassicas. Upon unfurling their second set of leaves, veggies begin to display their distinct and true selves, hence the name true leaves. Generally (which means, with many exceptions), most microgreens taste sweeter or more succulent when grown only to the cotyledon stage. The cotyledon leaves also are known to contain higher levels of phyto-nutrients. If you delay your harvest until after the second set has fully developed, your crop will be larger and taller, but likely slightly bitter and fibrous. Some microgreens taste better at the true leaf stage because they taste milder, as in the case of mustards, or less bitter, as in the case of most lettuces. A few others taste the same at both stages, but at true leaf stage become more fibrous and lose the melt-in-your-mouth feature of the seed leaf stage. Fragility renders the seed leaf stage less marketable for packing and shipping, which is why most commercial microgreens are grown to true leaf stage. Lettuce is especially fragile at both stages, which is why you seldom see lettuce microgreens in the marketplace. The true leaf stage also packs more weight and fills more volume than at seed leaf stage. The competition of the marketplace dictates weight and volume over delicacy and succulence. You the home gardener need not abide by any such rules. You have free choice, and need compete only against your own previous achievements. To sum up: the best rule here is to follow few rules, and with every day take samples, and with every sample take notes. Some hulls may cling to the leaves of some species, for instance fennel, fenugreek, beet, chard, cilantro, radish, sunflower, and some varieties of lettuce. Hulls cling so tenaciously to early spinach as to eliminate spinach from the ranks of microgreens. Indeed, if spinach appears on someone’s list of microgreens, he must be growing his on the moon. Likewise for hemp, in Canada and Europe its hulls also cling stubbornly to its seed leaves. In the United States, the Federal government additionally clings stubbornly to its mistaken and obsolete notions about hemp, and bans the importation of viable hemp seeds. Yet an American celebrity within the seldom credentialed field of vegan nutrition advocates that her followers sprout hemp seeds. Hers is not the voice of experience, but only of pipe dreams. Time now to shake things up. Before the harvest, lift up the container or tray, hold it firmly, turn it sideways nearly vertically over a tray or trash can or sink, and give your microgreens a massage. Brush the tops of their leaves gently with your fingers, the way you might pet a thick-haired Alaskan malamute dog or a long-haired Peruvian guinea pig. Despite your best intentions for the hulls to land where you hope, expect them to go flying elsewhere too, so prepare accordingly. Some hulls still will cling. If they are soft, such as on fennel, fenugreek, lettuce and radish, just go ahead and eat them along with the leaves. Those hulls are palatable and add a healthy dose of dietary fiber. But if they hard, such as on sunflower, cilantro, beet and chard, you do need to remove them, even if one by one. They are much easier to spot and to remove if you do so before harvest, while the microgreen is still firmly rooted in the soil. So do not procrastinate. Do it now! A week or two earlier, when you filled the container or tray with soil right up to its brim, you were preparing for this final step of snipping the stems just above their base in the soil. Delegate a pair of sharp scissors to use solely for harvesting. Scissors warrant a detailed discussion to ensure a clean cut of the stem if you refrigerate them rather than eat them upon harvest. A clean cut increases the longevity of your greens by guarding against rot or bacterial growth that might form upon the larger surface of a jagged laceration. Gardening shears, sold in gardening stores, and herb snippers, sold in kitchen supply stores, generally have long grips but short blades. On the plus side, some gardening shears have blades that disassemble for easy and effective cleaning. Barber scissors (barber shears) sold in pharmacies and hair salon stores have thin blades that work well for selective piecemeal harvests. But they can be relatively expensive, and pharmacies generally stock scissors only with short blades. For a wider selection, seek scissors in an office supply store. There you are sure to find more affordable scissors with long blades, and some with claims of anti-microbial properties. Scissors constructed all of steel are easy to clean, whereas those with plastic-coated grips can be bothersome to clean, especially if the plastic reaches to the joints. To harvest piecemeal, cut patches or rows into which the remaining greens can lean into as they grow. Snip at the base of the stems, and inspect the undersides of the stems for clinging soil. If you allow the remaining greens to grow for more than another week, be vigilant for mold that might develop among and on the stubble. To prevent or remove the mold, you can strip the stubble and lay bare the soil. Alternatively, interpret the first sign of mold as a wakeup call that it is time to harvest the remaining crop. When finished with the scissors, wipe clean the blades, and wash and dry them with the same care you would accord your forks and spoons. Do not rinse your harvest, unless you must wash off errant soil. The techniques of bottom watering that you will learn in the chapter devoted to Container Gardening and of side watering in the chapter on Tray Gardening should prevent any soil from splashing up onto the stems. You especially do not want to rinse if you will serve the greens later, and so intend to refrigerate them now. Moisture, even under cool temperatures, increases the risk of rot. If you nevertheless must rinse your microgreens before storage, then dry them upon a smooth towel or in a salad spinner. Spinning unfortunately adds not only one extra step to your workflow, but also one extra utensil in your kitchen to clean and to wash and to dry. Seeds of any one plant species begin germination across a broad time span. Some of the seeds inevitably are late bloomers, taking a week more or longer, in rare cases even a year more. Such sluggish seeds serve as life insurance against the catastrophe of a late spring freeze or a summer swarm of locusts or an early fall flood. Thus, if an entire crop were consumed or destroyed before it could “go to seed,” this would not spell doom for the species. The seeds that did not sprout this spring instead would germinate next spring, and though the species might not flourish neither would it perish. So if you are patient, you can tend to your newly shorn patch of earth in anticipation of a second wave of late bloomers. For most varieties, the second crop will be meager. But for some, notably radish, beet, basil, marjoram, arugula, and sunflower, the second wave can be substantial and well worth your wait. Generally (again which means, with many exceptions), the larger the size of the seed, the larger the yield of its second wave. Thus sunflowers produce many more waves than others. Radish is a Brassica whose seeds are larger than most other Brassicas, and radish produces a moderate second wave, while most other Brassicas except for the Asian mizuna next to none. Most mucilaginous (sticky when wet) seeds, though tiny, produce respectable second waves, in part because the stiff film they form atop the surface of the soil retards the germination of the seeds below that surface. Basil tops the list of mucilaginous seeds with worthy second waves, which compensates for the greater expense of its seeds. Along with exercising patience, you must be vigilant for mold that may develop on the stumps of the first harvest. Therefore, as not to harvest any potential mold, clip the first wave very low down the stem, and then the second wave very high up the stem. Leaves anyhow taste better than stems, especially stems of the second wave. After a full harvest, dump the clump of root-entangled soil outdoors, where it only rarely will turn to compost, because animal visitors more likely will pick it clean for any remaining edibles. Even to the bitter end, you must remain vigilant against the growth bacteria or mold. As fungal growth suppresses bacterial growth (think penicillin), you at least need not worry about both! To prevent bacteria or mold from contaminating the next crop, professional microgreen farmers rinse their seedling trays in dilute bleach. As an indoor gardener I long have omitted the bleach, which after all is toxic not just to bacteria and mold, but to you and me. If I were to rinse my containers with some antiseptic wash, I would choose dilute vinegar or dilute hydrogen peroxide, but I use neither. Instead I brush or shake off any soil deposits or root fragments. Then I allow the containers and trays to dry out in open air. When convenient, I place them under direct sunlight in a sunny window. Sunlight is an effective antiseptic. If I affixed labels to identify the greens, I remove the labels, as paper can rot and old labels are sure to confuse me. The containers and trays then remain fallow and dry for several days between crops. Reusing the same containers dozens of times and same trays hundreds of times, I never have seen any evidence of mold growth on empty containers or trays, nor in the soil that filled them thereafter. Caution: I cannot advise you to do the same as I do. (“Do as I say, not as I do!”) You might share your household with children or convalescents or elders, all who can succumb to intestinal illness from bacteria or mold that you and I effortlessly resist. If someday I were to see signs of mold or to experience food-borne illness from microgreens, then I would begin rinsing with dilute vinegar, and if that did not prove effective then with enzyme-based anti-mold cleansers, and if that did not prove effective then with dilute hydrogen peroxide, and if that did not prove effective then with dilute bleach. Bleach would be my last resort, not first resort, but I would resort to it. My wait-and-see attitude might be mistaken for lassitude. But after 40 years of growing and eating sprouts and microgreens, I still am eating and still am waiting. No matter how carefully you harvest them, random bits of stems and leaves might litter your kitchen counter or table or floor. These bits can be very troublesome to clean up, as their moisture causes them to cling to dry surfaces. A cloth or sponge, wet or dry, merely rolls them or mushes them, creating even more of a mess than before. Even worse, if you wait a while before cleaning up, the greens wither and dry out and stick even more steadfastly than before. Surely you have noticed that your need here for various tools or appliances is minimal. One duo-purpose kitchen tool that is very useful at this late stage is a food scraper, also just as impolitely called a food basher, which costs barely as much as two organically-grown avocadoes. Its single sheet of stainless steel sometimes is manufactured affixed to a plastic handle, sometimes not. Its wide end is beveled like a knife, but only on one side and not as sharp. Slide this scraper across the table, and the scraps of microgreens slide along with it as well as onto it. You might think it indulgent to devote an entire step to discussion of this simple tool, but use it just once and you surely will consider it an indispensable component of your tiny tool chest for growing microgreens. During storage or transport, protect the fragile microgreens in a hard container, not a bag, though a bag will suffice if handled gently. Refrigerate what you do not plan to eat immediately. (But do not refrigerate basil or amaranth, which under cool temperatures turn to mush.) The closer to freezing point you lower the thermostat on your fridge, the longer you can keep fresh your harvest. But wait! Before you harvest that surplus, or even before you stash it away in your fridge, if the timing is right and the season is warm, you can join ranks with the millions of farmers throughout history and even prehistory who have kept alive the worldwide ancient tradition of preserving seeds. Before the printing of mail order catalogs and before the invention of mail, farmers either saved seeds in the fall to sow in the spring, or they starved. So you too can transplant seedlings outdoors to grow to maturity to go to seed to harvest those seeds to sow indoors to grow into microgreens. 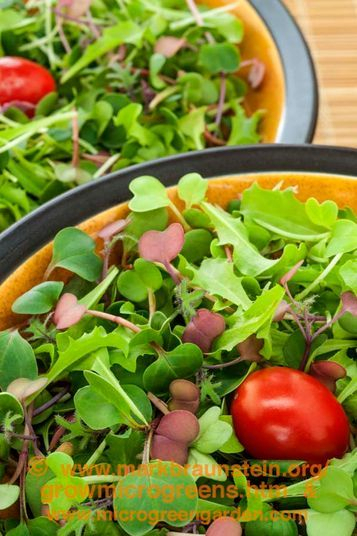 As with any garden vegetable, it is best to eat your microgreens soon after harvest, and to appreciate their flavors just as they are, unadorned by sauces and unadulterated by seasonings. Any condiment you might add makes a mockery of microgreens. Quite the opposite, use your microgreens as the condiment, for instance mustard microgreens instead of mustard spread. Some upscale restaurants adorn microgreens atop a hunk of steak or pork, in essence serving an ounce of prevention atop a pound of carcinogen. Chefs garnish with microgreens more to embellish the printed menu than to stimulate the palate. Added to a chunk of flesh, microgreens’ curative powers are negated and their culinary flavors are lost. Mixed into a salad of their elders, most microgreens’ flavors are lost there too. If they do not taste luscious, that could be reason to disperse them amid lettuce and tomatoes. Or think of cress or mustard, whose intense spicy heat begs for moderation and dilution. If you find a microgreen’s taste unappetizing at its seed leaf stage, then grow it to its true leaf stage. If you find it unappealing at its true leaf stage, then grow it one more week past that. Microgreens usually taste much the same as their elders. Thus radish microgreens taste the same as do radish tubers. As you already eat radishes raw, you will savor radish microgreens, which too are raw. Turnip microgreens, too, taste much like both turnip tops and its root crop. But if you not accustomed to eating the turnip root raw, nor to eating its leaves at all, then the taste of turnip microgreens will be new to you. If you eat mature broccoli always steamed and never raw, then the taste of broccoli microgreens will not appeal to you. We all are individuals. Regardless how objective or universal we try or hope to be, we all have unique preferences and differing tastes. And so do you. And so do I. Radical raw foodists savor nearly all microgreens, while for cooked foodists many microgreens will need to be an acquired taste. Whatever your dietary persuasion, you might well be wondering, “So now you tell me!” Indeed, this discussion about taste better belongs in this book’s preface. But too late now.